Shell shocked, bewildered, confused, gloomy, miserable, angry. The range of emotions that each of us Bradford City supporters have felt over the past few days have been vast and fast-changing. The number of questions we want to ask grows and grows. Phil Parkinson is no longer the Bradford City manager. His unveiling at the Macron Stadium on Friday was hurtful and strange. The moment where it really began to sink in. And now all that’s left to do is pick up the pieces and try to move on. It will not be easy. The range of reactions to the last few days has been really interesting. There are outpourings of grief akin to losing a family member, there is a sense of frustration that one of the best managers in the club’s history has been allowed to leave so cheaply, and there is betrayal that it hasn’t exactly taken Phil Parkinson a lot to walk away from what he has built. Bolton looks such a strange fit. If Parkinson really wanted to leave the club, you’d think he could have done better than that. You’d think he would have valued himself higher. What’s interesting is that he has been here before, exactly a decade ago in fact. After the outstanding achievement of taking Colchester into the Championship for the first time in their history, Parkinson upped sticks and took the Hull City job. Better paid, better prospects, but he was sacked in six months. It was the wrong club, it was a bad career move. Those who know Parkinson very well told me he would never make such a mistake again: putting money above stability, and not risking a hard-earned reputation. You hope that the same mistake hasn’t been made here. Time will tell, but he will do very well to stay at Bolton for as long as he has remained here. As I have wrote about several times over his reign in charge, the Parkinson story is not just about the glory nights and the mind-boggling cup achievements, it was about guiding Bradford City through slumps and long winless runs, knowing his job was just about safe. It is hard to imagine Parkinson surviving a run of one win in 21, for example, like he did at Valley Parade in 2013/14. History showed that Bradford City were absolutely right to stick by him then, as they were during that difficult first season, when he was struggling to impress and making hard work of keeping the Bantams in the Football League. Bolton come down to League One with fans undoubtedly – and justifiably – expecting a promotion push. Yet they are still in debt and with two transfer embargos that mean Parkinson can’t make any new signings, even free transfers. Last season, Shola Ameobi was willing to play for Bolton for free and the club still weren’t allowed to sign him. The likes of Ben Amos, Darren Pratley, Jay Spearing and Mark Davies are said to be on wages of around £20k per week. It is rumoured that Bolton’s new joint owners do not see eye to eye on everything. Parkinson will need time to turn that around, but he is not guaranteed to get it. The rumour is he was not happy about the City playing budget for next season, and that certain demands from new owners Edin Rahic and Stefan Rupp do not sit comfortably with how he wants to build a football club. Rumours are rumours; you believe what you want to hear. But right now, the facts aren’t available. And that’s a challenge for the new owners. So far they have being interviewed once by the T&A and as interesting as that piece was, it hasn’t done a lot to quench the thirst for knowledge from us supporters. Since 2012, Mark Lawn and Julian Rhodes operated a more low key approach and didn’t speak as much publicly, but that was after many years with their feet firmly under the table. We knew their plans. The statement from the club today – approved by the pair no doubt – fills in some of the blanks. They did want Parkinson to stay, they tried to persuade him his future should remain in West Yorkshire, and the lower compensation Bolton paid was probably due to the pair ultimately agreeing not to stand in Parkinson’s way when he was mind was so made up. All of which is fine and very professional (and better than how Bolton have acted). Yet the bottom line is Rahic and Rupp need to be more forthcoming with their views on the future. They need to be leaders. James Mason does a fantastic job front of house and long may that continue, but as fans we want – and deserve – to know what the big plan is here. It was jumping to conclusions to blame Rahic and Rupp for what has happened, but it didn’t look good. In the space of a few weeks we have gone from a settled, progressive football club that had just achieved a best league finish in 12 years, making the play offs. The owners left, and now the manager has gone too. If Lawn and Rhodes were still in charge, Parkinson would most likely be the manager still. Something or someone has pushed or lured him away. If Rahic and Rupp believe in a different vision for the club, great, but they need to share it. If they really are disappointed that Parkinson has left and it was not their choice, they deserve the benefit of the doubt. Parkinson is not the hero in this story, for sure. But then again no one is, and that is the problem for us City fans, wondering where this all leaves us. In a sense there are parallels between the situation at City and the EU Referendum. The Remain viewpoint is that whilst not everything is perfect, the positives outweigh the negatives and remaining in Europe can drive improvement. The Leave campaign is full of unknowns and a major shake-up of the country’s future. It might solve many problems and disgruntlements, but it might also throw up completely new issues. It is a gamble. Parkinson has made his own Brexit. And with Lawn and Rhodes gone, we simply don’t know what future lies in store. Whoever gets the job, we have no idea how they will fare. The old regime offered guarantees of steady progress and no implosions. That’s now being lost and we don’t have a clue what we’ve swapped it for. There are, amazingly, some City fans glad to see the back of Parkinson. They tell you his achievements were flukes, and that the last five years have been awful. They think that Parkinson failed/underachieved and that the club will now move forwards. Whilst I couldn’t disagree more, it’s not my place to criticise these people. The fact is we have reached a major crossroads in our history. Only time is going to prove whether this departure is a good or a bad thing. We need the context of knowing what happens next before we can conclude that Parkinson leaving is a catastrophe, a minor bump in the road, or a platform for bigger and better things. Take Paul Jewell’s departure as manager in 2000. Everyone agrees he was a brilliant manager, now. At the time, there wasn’t universal approval over the job he was doing and a feeling from many that we could do better without him. To my shame, I was one of the many City fans at Hillsborough in January 2000 who chanted at him “you don’t know what you’re doing”, and I remember feeling disgruntled over the final few weeks about his increasingly poor tactics and poor treatment of Lee Mills. I was wrong, but I only truly realised this after he had left and the club sunk. Interestingly, Jewell – who left partly due to unfair interference from Geoffrey Richmond – went to Sheffield Wednesday, who were just relegated from the Premier League, in lots of debt, and with high expectations to go straight back up. It was a bad move and Jewell was soon sacked. The parallels between Sheffield Wednesday then and Bolton now are very evident. In some ways Parkinson is in a win-win position in terms of his Bradford City legacy. If City continue to progress he can take credit for getting the club so far in the first place. 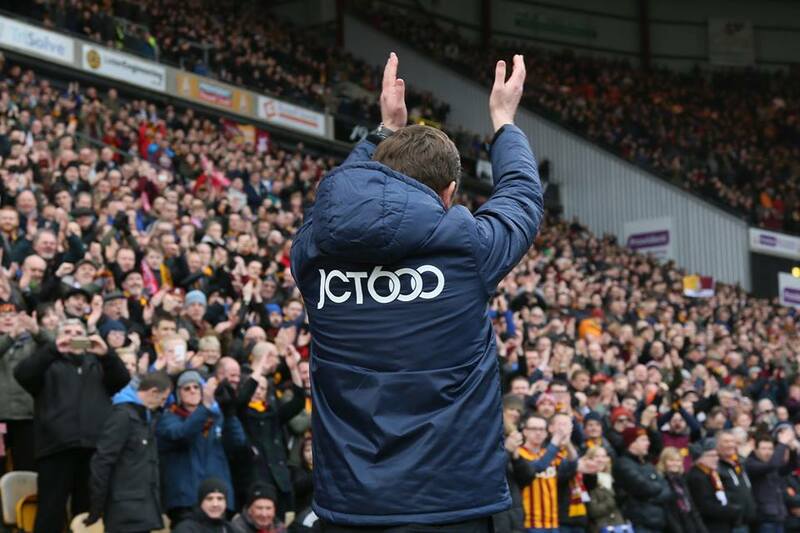 If it goes the other way, the job he performed at Valley Parade will seem even better. And those punching the air in celebration right now will look incredibly foolish. Ultimately Parkinson’s achievements will keep him in the highest of regard. Nights like Arsenal, Villa, Leeds and Millwall will never be forgotten. The occasions like Swansea, Burton, Northampton, Chelsea and Sunderland will be talked about for decades. The highs experienced under his watch were some of the biggest we have ever seen. The stories will be told and retold to our children and our grandchildren. Phil, it’s difficult to say “thank you” right now, but of course we will be forever grateful for what you did for the club. Leaving as you have taints it slightly, but that bitterness will fade much quicker than the memories you gave us. I hope Bolton treat you well. I hope the move works out. But more than anything I hope that we don’t suffer because of this. In Parkinson we trusted. And now it’s time for Rahic and Rupp to earn themselves that same level of confidence. I was and still am a big fan of PP but maybe this clean break is the chance for city to make the next push onwards. PP is not s coach who likes to take risks in the field and maybe that would be why he would prefer to move to Bolton than be expected to play a style he is not comfortable and have to get promotion st same time. Yes there is a big unknown with the future but hey, football is always spectacular and Chelsea’s decline last season could just as easily happen to us this season…a shock out of the blue that no one would expect. So even if PP had stayed there was no guarantee. The joy of football is the soap-opera style cliff hangers, the “what-if-we-win the next game and so-and-so lose” scenarios, the season defining injuries that remove key players or allow a reserve player to come in and become a household name. Whoever we get I will be right behind them…first and foremost my support is to Bfd City! I agree it feels awful that PP has left, this was his Bradford City and it’s been a great journey. I don’t see why there are rumours about the owners disrupting – they may have given PP targets that he doesn’t like but most bosses do. I just think it is what PP says it is, he wants a fresh challenge. One thing that hasn’t been mentioned anywhere but Bolton is effectively his hometown club being from Chorley. He may feel he can resurrect Bolton in the same way he has City and push them a league higher. Whatever is said, PP leaves us as an attractive option for a new manager. I know Uwe Rosler has been mentioned but that appears to be a very obvious connection to the owners. I have seen a lot of disapproval of Rosler -why? He did well at Brentford, couldn’t resurrect Wigan who were in decline and then was part of the ongoing farce at Leeds. I’d be happy with Rosler. Shame he can’t still play! I watched that video on twitter today “The Dilemma”. Brilliant and it made me sad, but it brought back great memories. That’s gone now though and we need to move onwards and upwards. It’s a shame but it isn’t the end of the world. Let’s be positive. Other than the shock of a trusted rock coming adrift and floating away the other big uncertainty for me today is how quickly they will move to appoint replacements for the entire coaching staff. What worries me about the comment in the T&A suggesting that they’ll take their time in reviewing replacement options,,is where that leaves the club in concluding contracts with Williams et al and identifying replacements and chasing new targets. Can’t get past the feeling that the new owners really only had one important thing to do this summer and they totally blew it. Can’t think it bodes well at all. If one reads the Business press there are many examples of businesses (especially those where the assets are intellectual rather than physical), changing hands where as part of the deal the original company founders or key senior management are locked into contracts for the next 2 or 3 years. PP was Bradford City. apart from Hanson every player in the 2015/16 first team squad had been signed by him. Constant evolution rather than revolution has got BCFC to three goals short of automatic promotion to the Championship. Cannot see these rookies fixing something that wasn’t broken. I would go for Mark Bower of Guiseley rather than Steve Evans, Nigel Adkins or Neil Warnock. What Exactly Have Our New Owner’s Bought Bradford City For ?. There Investers Which In The World Of Business Means Buy Cheap Sell Later For Nice Healthy Profit. The Balance Sheet Won’t Be Run Like Chairman Lawn & Rhodes Did They Put Every Possible Penny Into The Playing Side To Give PP The Best Budget Possible On Cheap Season Tkts. PP Must Have Been Disappointed At Something Or Someone With In Our Club. Moving Forward This Makes Me Think PP Knows Something We Don’t. Our Investers Need To Pull Rabbits Out The Hat And Quick. Really good and measured article. Superb summary as ever, and an early chance for the new owners to show what they’re made of. The golden era we come out of now may be a springboard for a new chapter. Ironically, the next managerial appointment could be second only to that of PP himself in terms of importance. As you rightly point out – only time will tell. Everything crossed here. I seem to recall Southampton and Leicester fans going through the same range of emotions when losing their managers, the two Nigels. But look what happened – their replacements did a better job than they had done. So it’s not all doom and gloom. Let’s just hope our wealthy owners make the right decisions to protect their investment and put a team on the pitch that can entertain as well as grind out 1-0 wins. I don’t think we as city fans should get too down hearted over pp leaving, he was a good in fact very successful manager. However when you get a new boss at work that you dont know you sometimes might think the grass is greener elsewhere? More money fresh challenge, pp is only human and he has jumped ship. Lets wait and see what happens next, new owners, new manager, new players same club! I personally think we need a fresh ethos at the club, more attack minded manager? How would pp have coped wity a better budget, look at the clown he signed from Hull?? Good manager gone, club still here. Thanks for the memories phil. Now we move on TOGETHER! Great article. I have gone through a number of emotions however I am looking at this with a glass half full scenario. Firstly Phil thank you very much fur the last 5 years. I feel that along with Julian and Mark you have brought Bradford city back to life. I will always remember you in high regard. This is the end of a era, you three have brought the club together we win and lose together and you have developed 18k season ticket holders / a buzz / a family. – I could go on and on with the individual achievements but I feel that this is the greatest success. End of an era. . . . . But what an opportunity this presents for the new management team to progress and take us further forward. Secondly, wiith my glass half full optimism I feel that the new owners have managed this whole situation brilliantly and professionally. From what has been said I do not believe that they would have planned or expected to lose the whole management team within the first month of ownership. They have shown Phil Parkinson the most upmost respect, rewarded his achievements by not standing in his way and have reduced the compensation. I have read a lot of comments about the owners today – in my opinion they deserve the benefit of doubt and in return they need to gain supporters trust, however this will take time and can not be achieved in a two week period. Us fans are not sure of the future plans or the direction they want to take us in, however I highly doubt they know the exact detail as losing Parky does throw a spanner in any plans that were made since the take over. From the outside removing the conspiracy theories and taking everything on face value – if they owners continue to manage situations as they have the Parkison switch I am optimistic that we are in good hands and confident that they will be able to take the club forward with integrity and a professional manner. Finally, maybe Parkinson did just want a change and he left for this reason. I also feel that he may have been uncomfortable and taken out of his comfort zone with the expectations of the new owners. Glass half full – this is the best time to leave, it would be better than Parky being given resources to put a team together that he could not manage and coach. The owners have mentioned an investment in youth – this is simply not Parkys style he likes season pros such as McMahon, Gary Jones, who are leaders etc (I felt McMahon had a decent season but he is a fullback and should not be keeping natural wide men out of the team and going to millwall needing 3 goals I could not believe he started, but this was a typical safe Parky decision). Parkys style of football direct and rigid 442, this has served us well but I believe this would restrict any further progression it has its limits. The new owners may have a different brand of football that they would like to see. Has Parky ever moved from direct football with a 442 formation? Did he feel that he could not deliver this? So in my glass half full opinion Parky has an opportunity to take over a local team resurrect them and play his way. So finally my conclusion is that this deal is best for both parties, we need to give our owners the benefit of the doubt, they need to move quickly and put a whole new management team in place to ensure that we do not get left behind at the start of the season and it is an exciting new chapter, we may be exposed to some exciting entertaining football with s more youthful look. I for one am excited and believe the new era is the opening to the next step of progression. Although i’m gutted PP has left, we have to move on and not dwell on the why’s, what ifs, could’ve beens and if onlys. He (along with Rhodes and Lawn) has left the club in a very good state which can only be built upon. I would rather be in our position that Bolton’s! Parky stated in his press conference that Rupp and Rahic have big plans for the club moving forward and our plan is to get in the top two next season, so let’s put our trust in them pick the right man to deliver this. It is a very worrying time being a Bradford City fan at the moment, but let’s be patient. Enjoy the Euro’s and let the board do their job in the meantime. Come August we will have a new manager and set of players ready to challenge for the Championship. Hopefully this time next year we will be saying Phil who? Only joking Parky i love ya! Parky has gone, and this article is another piece of fine journalism given the circumstances. It is really hard to find the right balance of tone in summing up the position that this resignation leaves our club in, but Jason has achieved that goal. Even with Parkinson in charge, we had work to do this summer; without Burke, Cullen and Evans our squad was short of quality, and with our new owners in place there were questions over which way our club was heading. However, with Parky taking his assistant manager, fitness coach, goalkeeper coach and chief scout, we now are a ship without a rudder. If this had happened 6 months ago, I would have been hopeful that Mark and Julien would have found a replacement manager to carry on the good work of the past 4 years; all appointments are made with fingers crossed, and whoever they picked might not have worked out. But with Mark and Julien no longer on board, it is a massive decision for Rahic and Rupp to make, given there almost complete lack of lower league football knowledge. Given the circumstances, I would find it hard to believe that they would wish to undertake this task without any outside help. In our hour of need I wonder if either of our former owners will have any input, or even if they will be asked? Can we hope then, in letting Parkie’s exit without allegedly demanding full compensation, they will move quickly to bring in a credible new team? Any insights/ inside word, Jason/ WITP…? All I know is the Steve Evans speculation was way off (phew) and I’ve heard that Redfearn has an interview this week. Interesting comments from Rosler today. Despite the denials the last sentence of the article suggests he is in talks. He obviously see’s BWFC as a better club. And a better chance of achieving success at the Macron. And for your information, the TRANSFER EMBARGO will be lifted within a few weeks! & BWFC will surely attract better quality of player than Bradford can. And as for the Debt that was more or less wiped out with the sale of the club. It’s stands at about 20million now. Enjoy the up & coming season, I’m sure Bradford & BWFC will be fighting towards the top of the league. I’m going to try that one with my mortgage lender….. !